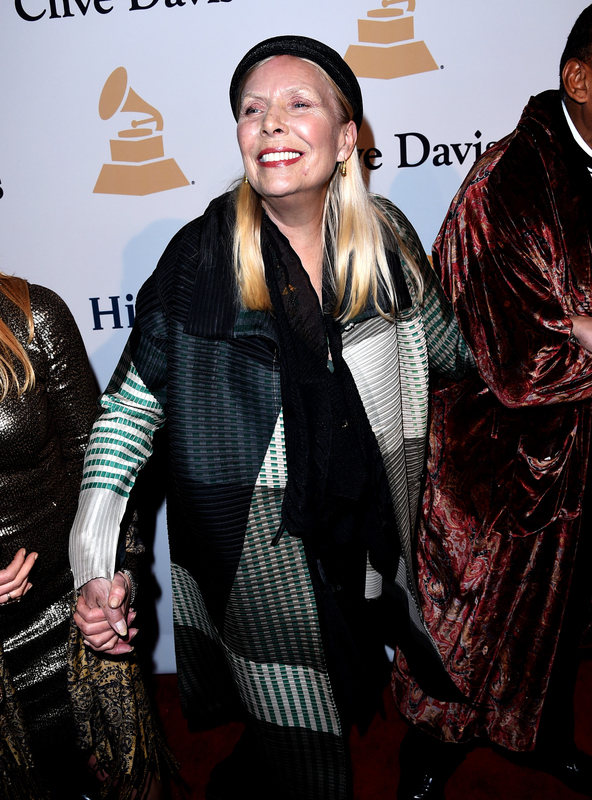 It's been a while since we've heard an update on Joni Mitchell's health, and I don't know about you, but I've been looking out for any news there is regarding her condition. Mitchell was hospitalized on March 30 after being found unconscious in her Los Angeles home. In the days following, it was reported that the singer was "awake and in good spirits", which was a relief to many, but the update still did nothing to quell the many questions about what happened to begin with. The details surrounding the incident which led to Mitchell's hospitalization were unclear and have remained unknown to the public ever since — at least until now. In an interview with Huffington Post Live published on Friday, June 26, Mitchell's longtime friend and fellow musician David Crosby claimed that Mitchell had suffered an aneurysm. Crosby admitted that Mitchell's condition is serious and that he is unsure when she would make a full recovery, but he remains confident that she will indeed bounce back from the health challenges she faces. "To my knowledge she is not speaking yet. She is home, she is in care, she is recovering," Crosby stated. "She took a terrible hit. She had an aneurysm, and nobody found her for a while. And she’s going to have to struggle back from it the way you struggle back from a traumatic brain injury." Crosby further went on to describe Mitchell as "a tough girl and very smart" but declined giving any further specifics about the situation. "Contrary to rumors circulating on the Internet today, Joni is not in a coma. Joni is still in the hospital - but she comprehends, she’s alert, and she has her full senses. A full recovery is expected. The document obtained by a certain media outlet simply gives her longtime friend Leslie Morris the authority - in the absence of 24-hour doctor care - to make care decisions for Joni once she leaves the hospital. As we all know, Joni is a strong-willed woman and is nowhere near giving up the fight. Please continue to keep Joni in your thoughts." Since then, no further information has been released, and Mitchell's team has not responded to Crosby's statement to confirm or deny the specifics of her condition. While we may still be in the dark regarding what actually happened to Mitchell back in March and how she's doing now, there's one thing we can likely all agree on: we hope she gets better soon.